We have been taking a organic farming course this winter. In the process we have met a number of wonderful people who are all interested in farming and growing gardens. I have been inspired by the veriety of people drawn into this class. I think living last year in NYC created with in us a great hunger to connect more deeply with the earth, nature and growing things. It is wonderful to be back in MI and have a yard where we can get close and personal with our food source. 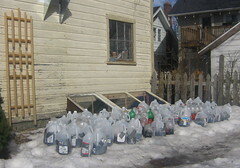 The picture here shows Brenda's current progress with her winter sowing containers. This is a wonderful way we have learned to extend the growing season in a northern climate like MI has. You can also see the cold frame behind which I built out of scrape wood and old storm windows pulled from dumpsters. The Beatle song "Here Comes The Sun" has been in my head lately.